Ascites is a condition where fluid builds up in the abdomen and may result in swelling, chest pain and shortness of breath. The main cause for ascites is cirrhosis of the liver, notes Drugs.com. The website adds that ascites may also be caused by cancer, kidney disease, pancreatitis and heart disease. Certain herbs can reduce swelling and fluid in the abdomen through their diuretic properties. Consult a health practitioner before treating yourself with herbs for this condition. Two of the main causes of cirrhosis of the liver are alcoholism and hepatitis C. The active ingredient in licorice root may help reduce the incidence of cirrhosis, reports the University of Maryland Medical Center. Ascites is a concomitant symptom developing when the liver is inflamed. Licorice root possesses diuretic properties that may alleviate the fluid buildup and swelling in the abdomen, notes "The Green Pharmacy Herbal Handbook." Licorice root can raise the blood pressure and thin the blood. It may also interact with steroids and pharmaceutical diuretics. Before using this herb, check with your health practitioner to confirm that it will be safe for your condition. Burdock root was used traditionally both in Eastern and Western medicine for a broad variety of health conditions. It is still widely employed by herbalists for liver and kidney problems, to remove excess fluids from tissues and to treat arthritis, tumors and a host of other diseases, according to Wilkes University. Burdock can be consumed cooked like carrots or raw on salads. Additionally, the root can be dried and made into tea by boiling about 1 tsp. in 1 cup of water for 10 minutes. Strain, cool and drink 2 to 3 cups daily to reduce swelling and fluids from the abdomen. Burdock root acts as an anti-inflammatory and may reduce swelling and pain due to inflammation or fluid retention. Some people may experience a rash from handling the burdock plant's leaves. If you develop symptoms, stop using this herb and contact your herbalist for instructions. Most rashes clear up rapidly once the medicine is discontinued. The common dandelion that grows in your yard is also a powerful herb with many medicinal properties. It is considered a bitter herb, and the entire plant is used in foods and for other herbal preparations. It aids the digestion and stimulates the production of digestive juices in the pancreas and liver. 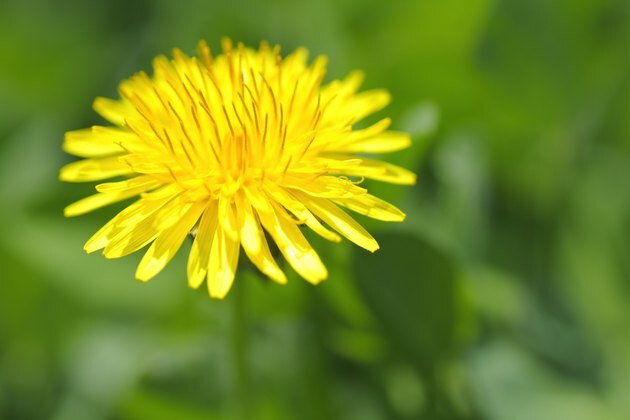 Dandelion reduces inflammation in the liver from cirrhosis and is useful in the treatment of hepatitis and gallbladder disease, according to Columbia University. Dandelion also has a strong action on the kidneys, notes UMMC, acting as a diuretic by pulling excess fluids from tissues. Drinking dandelion tea may be helpful in relieving ascites from the abdomen. Brew 1 oz. of the dried herb in 1 pint of boiling water for 10 minutes. Strain, cool and drink with a spoonful of honey. Dandelion may cause side effects, especially for those taking pharmaceutical diuretics or other medications for liver and kidney disease. Consult with your herbal practitioner before using this herb.